As soon as the “endWatch” function is called, the watching process is stopped and the app will not get any more events, so in your case the “SensorWatchOption” is no longer effective. The app can still do a “read” or start a new watch point with “startWatch”. 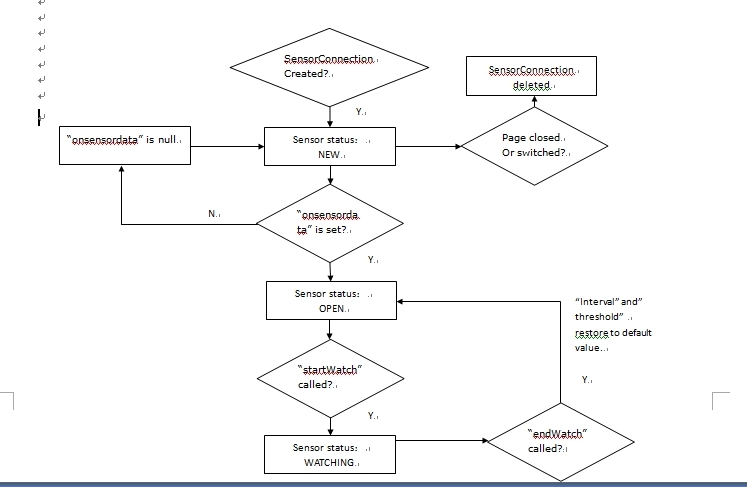 The “interval” attribute and” threshold” attribute of  “SensorWatchOptions” are transferred when “startWatch” function is called. But I do not find how to deal with them when “endwatch” function is called. So my question is : “Is “SensorWatchOption” still effective after the “endwatch” function was called?” if still effective, I am afraid that it would adversely increase the power consumption. Next message: 吴静: "答复: comments of Network Information API"
Previous message: Device APIs Working Group Issue Tracker: "ISSUE-125: Capabilities API compatibility with web privacy and security, assuming untrusted, fingerprinting risk"
In reply to: 张成岩: "comments of sensor API"